"It’s durable, comfortable to hold, and has a grippy handle." "Works as a detangling brush as well as an undercoat comb." "Designed to remove loose fur and undercoat hair while removing dirt." "Stainless steel blade is gentle on the skin but removes loose fur with ease." "The wide teeth painlessly remove tangles, mats, and dirt." "Just the right texture to remove dead hair and dandruff." "Silicone tips turn grooming sessions into a massage for your cat." "Designed to work when wet, with soft rubber bristles that attract loose fur." Our best overall brush is the Hertzko Self Cleaning Slicker Brush. It makes grooming time a breeze thanks to its fine, slightly bent wires, which work their way deep into your cat’s coat without irritating the skin. It’s also extremely easy to clean—a button makes the brush’s bristles retract, allowing you to easily wipe away fur as you go. It’s durable, is comfortable to hold, and has a grippy handle to keep the brush from slipping during grooming sessions. It works equally well on long and short-haired cats and makes short work of mats in your pet’s coat. “So much cat hair,” customers write, noting that the Hertzko brush is so effective that they tend to finish grooming with enough fur for a whole second cat. It does an excellent job of getting to a cat’s undercoat, removing loose fur that other brushes miss. Long-haired cats require a little more in the way of grooming, and you’ll want the right tool to make your task as easy as possible. The GoPets Dematting Comb is multi-functional, working as a dematting and detangling brush as well as an undercoat comb and deshedding rake. It can be used to cut through the most troublesome mats, then brush them out—a major perk for any owner of a long-haired cat. The comb is double-sided with varying densities of teeth, so you can switch between breaking down mats and removing loose undercoat fur without reaching for another tool. If your long-haired cats tend to go on the run when the brush comes out, customers write that they take surprisingly well to the GoPets Dematting Comb. That’s fortunate, because it’s one of the most effective and versatile brushes available, and serves as a perfect one-stop shop for your long-haired cat’s grooming needs. Looking for a brush for your canine as well? Check out the best dog bushes available for purchase. For short-haired cats, we love the SleekEZ Deshedding Grooming Tool. This simple brush uses a single set of teeth that’s specifically designed to remove loose fur and undercoat hair while removing dirt and dander. While it’s not made for detangling fur, that’s less of a concern with short-haired felines—and with regular use, it does an excellent job of cutting down on shedding. The tool also looks great, with poplar wood handle that’s more attractive than most grooming devices. As a bonus, it can also be used to remove fur from upholstery—a task most cat owners are all-too-familiar with. Customers write that “this little hunk of wood” works wonders for their cat, removing more fur than many fancier and more elaborate brushes. While the tool’s metal blade looks a little scary, cats tend to like the way it feels during use (and it won’t damage the fur or skin). Tired of finding mounds of cat hair on your couch and in your bed? You might want to invest in a de-shedding tool designed to get at the fur in your cat’s undercoat. The Paws & Pals Deshedding Tool uses a stainless steel blade that’s gentle on the skin but removes loose fur with ease. With regular use, it will reduce your cat’s shedding while also helping to rid their coats of dander. It has an ergonomic grip, and the relatively long teeth of the brush help to get deep into the undercoat and break down mats. Customers write that in addition to cutting down on shedding, the Paws & Pals tool has also helped reduce the regularity of hairballs thanks to their cats swallowing less loose fur during self-grooming. 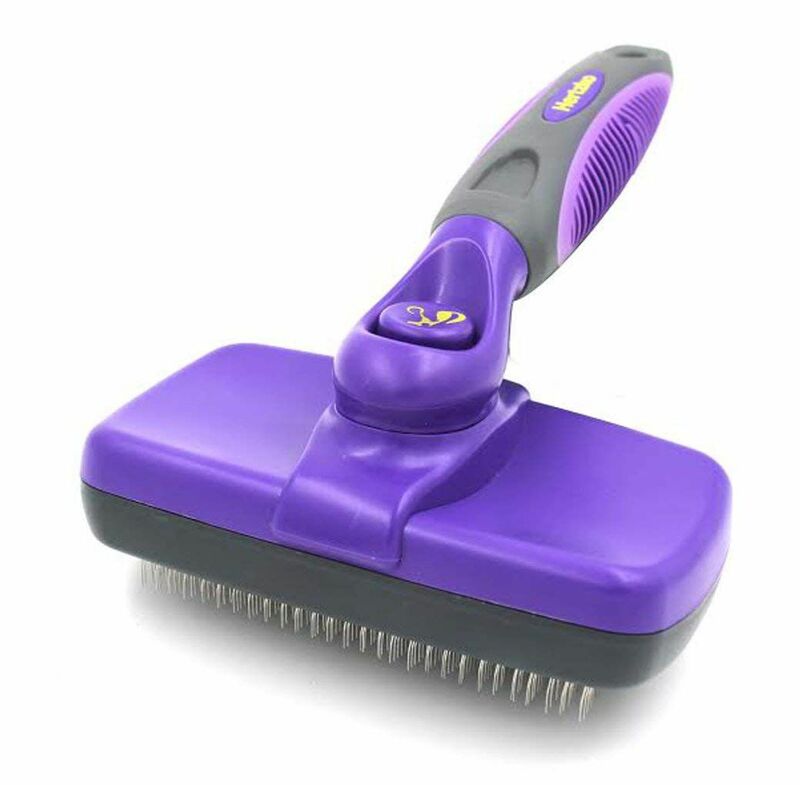 Others write that it’s a lifesaver for anyone with a dander allergy or sensitivity since the brush does a great job of capturing it along with pet hair. Also, to make sure that excess pet hair doesn't irritate your eyes or nose, invest in one of the best vacuums for pet hair. Mats in cat fur aren’t pleasant for your feline, so you’ll want to catch them before they become so severe that they need to be cut out. The Andis Steel Pet Comb is just the ticket, painlessly removing tangles, mats, and dirt. The tool includes two sets of teeth: one wide and one narrow. The wide set is what you’ll want to use for breaking down mats, although it can also be used to simply fluff your pet’s fur. The narrow set is great for cats with shorter hair, or grooming sensitive areas like the face or paws. The comb is also made of stainless steel, making it more durable and long-lasting than plastic options. The Andis Steel Pet Comb breaks down mats and tangles that would be difficult using other tools, customers write, noting that it’s a must-buy for owners of long-haired cats. The extra-long teeth are highly effective (the comb is sold in either 7.5-inch or 10-inch model), and for some, it’s helped to cut grooming time by as much as half. While a good brush shouldn’t be your sole line of defense against dandruff (look into your cat’s diet if it’s a persistent issue), it’s an important piece of the puzzle. You’ll want to use a brush that’s neither super soft nor overly stiff, and we love the Mars Boar Bristle Cat Hair Brush. As the name implies, the bristles are made from the fur of a wild boar, and they’re just the right texture for combing through your cat’s coat to remove dead hair and dandruff. It’s well-made, with solid beechwood construction, and the bristles are gentle on the skin. Customers love that the Mars Boar Bristles Cat Hair Brushes holds onto loosened fur during use, rather than causing it to fly all over the room. While it’s better suited to short-haired cats (it will not remove tangles), it should become a regular part of your grooming routine if your pet is experiencing dandruff. Looking for more information on your cats grooming habits? Read through our article on hair loss in cats. If your cat hightails it for the nearest hiding place whenever it’s grooming time, try using a glove instead of a standard brush—often, your cat will think you’re petting them (rather than subjecting them to some bizarre torture). This glove from Delomo uses 255 silicone tips to turn grooming sessions into a massage for your cat, working through fur and helping to brush away loose hair, dirt, and dander. Fur will stick to the glove, making it easy to clean, and the soft, eco-friendly rubber is free of materials that could harm the skin. One size glove fits all (it includes an adjustable wrist strap), and the product is sold by the pair. Reviewers note that the Delomo Pet Grooming Glove is a hit with previously picky cats—one customer writes that after one use, his cats now “line up” for grooming time when they see the glove come out. More importantly, though, it removes loose fur with ease. While hair can stick to the rubber material, it’s still generally faster than using a brush (especially when using two gloves). Bathing your cat is rarely the most pleasant of experiences, so you might as well make the most of it. The Hertzko Peth Bath & Massage Brush is designed to work when wet, with soft rubber bristles that attract loose fur during bath time. It’s easy to clean—simply rinse it off, and the hair will release—and the textured grip makes it easy to hold when wet. It can be used with both short and long-haired cats, and the design of the bristles help ensure soap works its way into the hair root for a deeper clean. Customers write that the Hertzko Pet Bath & Massage Brush works incredibly well, particularly on cats with medium or long hair. You don’t need to apply much pressure for it to get the job done, alleviating any worry of accidentally causing your pet pain or discomfort during use. While cats generally aren’t huge fans of water, the brush also has a massaging effect that helps bath time go much more smoothly. Our writers spent 4 hours researching the most popular cat brushes on the market. Before making their final recommendations, they considered 30 different cat brushes overall, screened options from 15 different brands and manufacturers, read 50 user reviews (both positive and negative), and tested 1 of the cat brushes themselves. All of this research adds up to recommendations you can trust.